Spice up those neurons … with spices! The elderly in India who consume turmeric in their curries daily have the world’s lowest rate of Alzheimer’s. Scientists used to think that you were born with all the neurons you’d ever have. Then in 1998 researchers discovered the birth of new neurons in individuals who were near death. Turns out your brain – no matter how old or young – can generate new neurons. One key to brain growth? Diet. What you eat helps generate healthy neurons with bushels of dendrites (nerve receptors). It also keeps nerve endings firing and allows you to maintain brain flexibility. 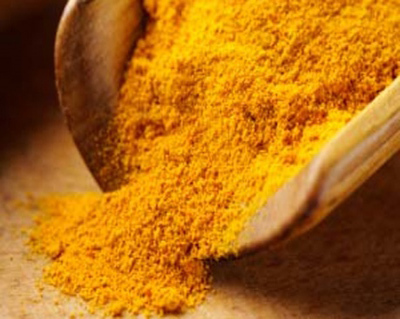 The National Institutes of Health lists 24 current studies on the effects of turmeric and its chief active component, curcumin. Turmeric (Curcuma longa) is a culinary spice, a major ingredient in Indian curries, and the source of American mustard’s bright yellow color. So, will a little Indian curry help your brain? Used as both medicine and food for centuries, accumulating evidence suggests that this relative of ginger is a promising preventive agent for a wide range of diseases, probably due largely to its anti-inflammatory properties that fight some cancers and multiple sclerosis. The chemical curcumin that makes turmeric yellow appears to activate a key antioxidizing enzyme that reduces plaque buildup. According to Dr. Andrew Weil, turmeric contains more than two dozen anti-inflammatory compounds, including six different COX-2-inhibitors (the COX-2 enzyme promotes pain, swelling and inflammation). Studies at the University of California found that in rats prone to accumulate beta-amyloid plaque in their brains – the abnormality associated with Alzheimer’s disease in humans – curcumin blocked the plaque’s accumulation. It also reduced inflammation related to Alzheimer’s disease in neural tissue and the rats fed curcumin performed better on memory tests than rats on normal diets. Saffron fights depression in humans, as well as improving learning and memory in animals. Saffron twice daily was as effective as Prozac in treating mild to moderate depression, according to a 2005 study in the Journal of Ethnopharmacology. Sage, the aptly named herb, is a potent antioxidant and anti-inflammatory. Chinese sage root contains compounds similar to Alzheimer’s disease drugs, and just 50 microliters (.001690 fl oz) of sage oil extract significantly enhanced memory, according to research in Pharmacological Biochemical Behavior. Sage is a great addition to salads, in soups, even on pizza. It tastes and smells better fresh. Read more about Cinnamon HERE.